Prof Daniel Janzen, a biologist from the University of Pennsylvania, photographed a caterpillar in Central America; have been working and tracking various kind of cater pillar in Costa Rica since 1978. What amazes Prof Daniel is that Prof every caterpillar in this area seems to be different from another has resembled things like twigs or leaf. Professor also adds that to normal people caterpillars might look creepy and scary but for him it is like walk in park. While he was tracking some cater pillars as a part of his work. Professor says that this caterpillar has a quality of deception. It extends its end part of the body and tucks its legs. The marking on the end of this caterpillar when extended makes it look like a dangerous reptile. Hence from far end this fat neon green might look scrumptious to any predator. 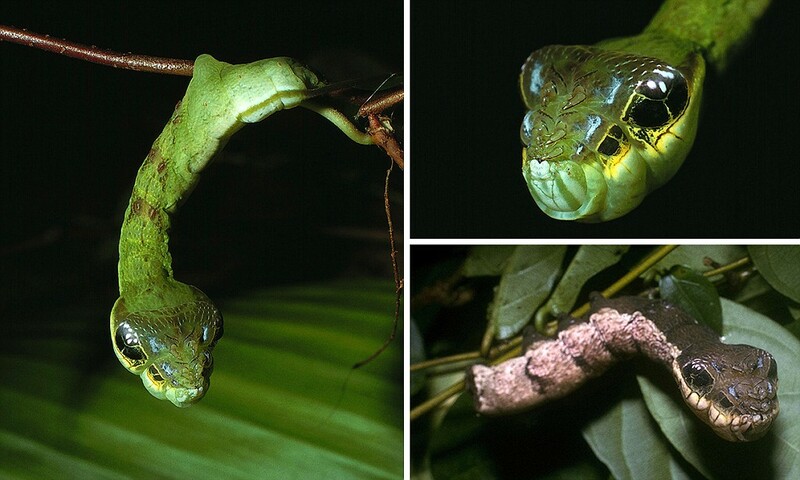 But when it comes closer to this caterpillar looks like a dangerous snake. One more Trivia added by Professor Daniel is that this example of caterpillar is captured in the Area de Conservacion Guanacaste World, a UNESCO Heritage site to the north-west of the country as a part of the Hemeroplanes family. Well we all know that Mother Nature has gifted us with different habitant qualities. This caterpillar has the unique one of safeguarding itself from dangerous predators. Hope we all know are predators well and try to safeguard ourselves as per that.